Try teaming a grey short sleeve shirt with ASOS DESIGN asos skinny jeans in mid wash blue with rip repair from Asos for a weekend-friendly look. You could perhaps get a little creative when it comes to footwear and dress up your ensemble with grey low top sneakers. If you feel more confident in comfy clothes, you'll love this sharp combo of a tan trenchcoat and ASOS DESIGN asos skinny jeans in mid wash blue with rip repair. 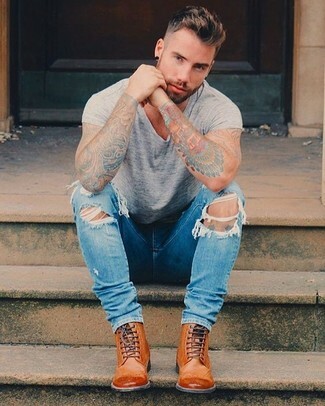 Let's make a bit more effort now and grab a pair of dark brown leather brogues. If you're all about relaxed dressing when it comes to your personal style, you'll love this stylish combination of a blue denim jacket and blue ripped skinny jeans. When it comes to shoes, this getup is complemented nicely with tan high top sneakers. If you prefer practicality dressing when it comes to fashion, you'll love this simple pairing of a black blazer and ASOS DESIGN asos skinny jeans in mid wash blue with rip repair. Go for a pair of white low top sneakers to take things up a notch. 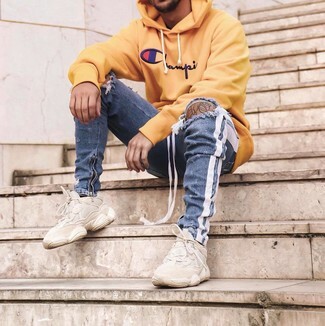 Choose a yellow print hoodie and ASOS DESIGN asos skinny jeans in mid wash blue with rip repair, if you feel like comfort dressing without looking like a hobo. When it comes to footwear, this look pairs wonderfully with beige athletic shoes. If you prefer comfort dressing when it comes to your personal style, you'll love this neat combo of a black quilted leather biker jacket and ASOS DESIGN asos skinny jeans in mid wash blue with rip repair. Channel your inner Ryan Gosling and make red leather high top sneakers your footwear choice to class up your look. 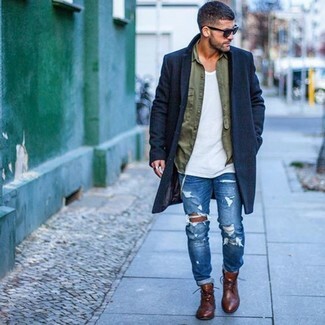 If you're on the hunt for a casual yet on-trend ensemble, try pairing a navy overcoat with blue ripped skinny jeans. Both garments are totally comfortable and will look great paired together. Got bored with this ensemble? Enter brown leather brogue boots to shake things up. 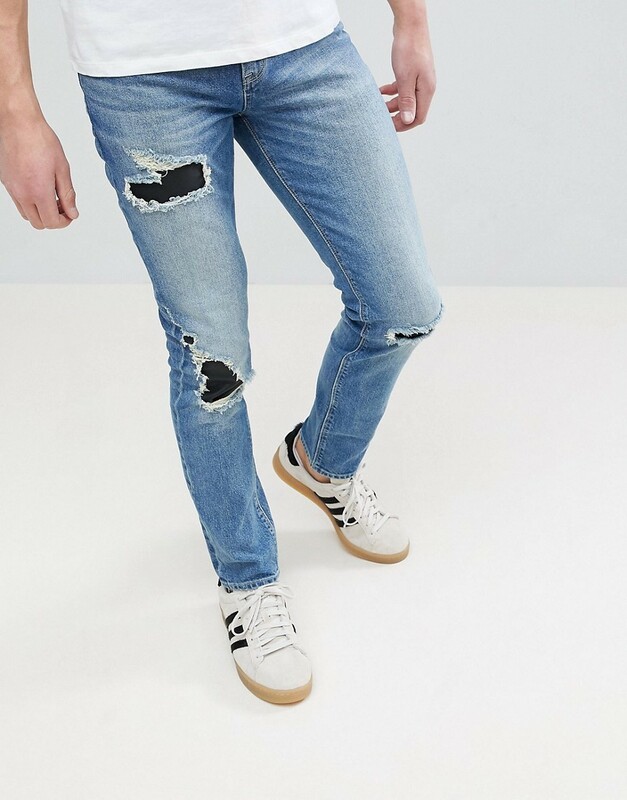 We all look for comfort when it comes to dressing up, and this combination of a grey crew-neck t-shirt and ASOS DESIGN asos skinny jeans in mid wash blue with rip repair is a vivid example of that. To add more class to your outfit, complete with tobacco leather brogue boots. 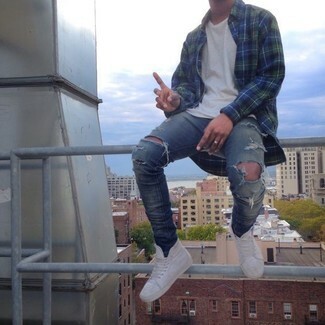 Reach for a navy and green plaid long sleeve shirt and ASOS DESIGN asos skinny jeans in mid wash blue with rip repair for a comfy-casual look. 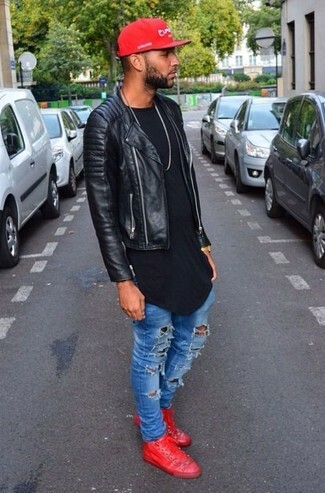 Complement this getup with white high top sneakers.